Written by CMOS Bulletin SCMO on September 11, 2018 . Posted in Atmosphère, Climat, Quoi de neuf. Les nuages constituent un élément essentiel de l’atmosphère terrestre, car ils redistribuent les ressources en eau et contribuent au forçage radiatif de l’atmosphère (Pruppacher et Klett, 1997; Lohmann, 2006). La glace est présente dans de nombreux types de nuages et joue un rôle clef dans la formation des précipitations. Malgré leur importance en ce qui a trait au climat, les processus associés aux nuages génèrent certaines des plus grandes incertitudes dans les modèles climatiques (Boucher et coll., 2013), car la formation de glace n’est que partiellement comprise. Pour représenter adéquatement les nuages dans les modèles climatiques, nous devons améliorer notre compréhension fondamentale des processus qui régissent leur formation et leur évolution. Nous devons étudier tant les processus microphysiques se déroulant à l’échelle moléculaire que la macrostructure des nuages, que régissent le rayonnement et la dynamique. Grâce à mes recherches, je contribue à améliorer notre compréhension, à la microéchelle, des processus de formation de la glace dans des conditions nuageuses. Je me penche notamment sur les particules biologiques présentes dans l’atmosphère et leur capacité à faciliter la nucléation de la glace. Dans le bref article qui suit, je présente un aperçu de mes recherches sur la nucléation de la glace sur les particules de pollen, qui perdent cette capacité lorsque le radical hydroxyle, très important sur le plan atmosphérique, les oxyde chimiquement. Clouds are a crucial part of our Earth’s atmosphere as they redistribute water resources and contribute to the atmosphere’s radiative forcing (Pruppacher and Klett 1997; Lohmann 2006). Ice is present in many clouds and is known to play a central role in precipitation formation. Despite the important role in climate, processes associated with clouds represent some of the largest uncertainties in climate models (Boucher et al. 2013), with ice formation only partially understood. To better represent clouds in climate models, our fundamental understanding of the underlying processes controlling their formation and evolution need to be improved. Challenges span from the need to investigate microphysical processes, occurring on the molecular scale, to the macro structure of clouds, driven by radiation and dynamics. Findings from experimental research in the field or laboratory need to be developed into a quantitative format for inclusion in complex climate models. With clouds having a significant impact on the climate and water resources, their representation in climate models requires well developed parametrizations of the experimental and modelling studies. With respect to the specific microphysics of ice-forming processes in the atmosphere, more studies on the pathways on the components involved or impacting the ice forming stage are needed. With my research I contribute to a better understanding of the microscale processes of ice formation under cloud conditions and specifically focus on biological materials in the atmosphere and their ability to facilitate ice nucleation. In the following brief article, I will give an insight to my ice nucleation research on pollen particles. In the atmosphere, the ice phase can form either homogenously, where water is supercooled to temperatures below -38°C and subsequently freezes; or heterogeneously at higher temperatures, where ice nucleating particles (INPs) with specific surface properties initiate the freezing process by lowering the energy barrier for ice crystallization. To date, the specifics of INP surfaces which make ice nucleation a highly selective process are not fully understood. With INP concentrations in the atmosphere being extremely low – only 1 in 105 particles in the atmosphere serves as an INP (Rogers et al. 1998; DeMott et al. 2010) – the ice nucleation process of these IN active particles is highly efficient. Particles which are found to be good INPs are mineral dust, some specific inorganic and organic materials, as well as select biological particles such as fungal spores, bacteria and pollen (Hoose and Möhler 2012; Möhler et al. 2007). Figure 1. Particles from various sources – including deserts, oceans and urban areas – get emitted into the atmosphere in large quantities. When experiencing cloud conditions with low temperatures and high relative humidity, some of the particles have properties which facilitate ice nucleation. These particles are referred to as ice nucleating particles (INPs) and impact cloud properties, radiative forcing and precipitation formation. Throughout their atmospheric lifetime, these INPs may be exposed to chemical or physical alterations, potentially leading to modifications of their shape, morphology and chemical structure; and impacting the particle’s IN ability, and hence its role in cloud processes. Better understanding of INPs and their role in cloud processes requires a comprehensive investigation of INP processing pathways possible in the atmosphere. From the variety of INPs, biological particles have received much attention in recent years after the estimated amounts of primary biological aerosol particles (PBAPs) emitted into the atmosphere were increased substantially (Jaenicke 2005) but remain poorly quantified. Given their organic composition, such biological INPs may experience chemical processing in the atmosphere. In particular, their surfaces consist of numerous chemical functional groups which are highly susceptible to chemical reaction, especially oxidation via common atmospheric oxidants such as ozone and the hydroxyl radical (OH). OH, for example, is highly electrophilic (“electron loving”) so that it can react at multiple locations within large biological molecules, potentially altering the surface structure of the INPs to a degree that ice nucleation becomes less efficient. These effects of atmospheric oxidants on biological INPs are unexplored. In my study, I focused on pollen INPs, which are emitted into the atmosphere in large numbers during vegetation blooming seasons, and investigated their IN ability when exposed to the hydroxyl radical in simulated cloud water (Gute and Abbatt 2018). Pollen comprise significant amounts of water extractable compounds which are also referred to as subpollen particles (SPP) on their surface and inside the grains. The SPPs are of submicron sizes, which compared to the relatively large pollen grains (few tens of micrometers) can be easily suspended and transported by atmospheric winds. These small particles are believed to be polysaccharides and have been shown to be active as INPs. Figure 2. Scanning Electron Microscope (SEM) image of an intact silver birch (Betula pendula) pollen grain. 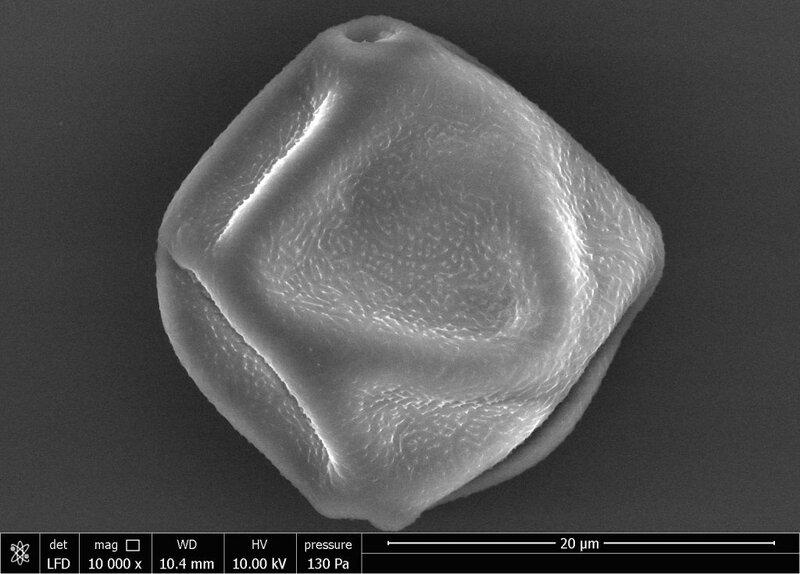 Full birch pollen grains have sizes between 16 and 27 µm. Image taken by Ilya Gourevich, University of Toronto. Based on this knowledge and motivated by the very small number of prior studies, which investigated the effect of ozone on organic and biological INPs, I investigated OH oxidation in simulated cloud water and its effect on the INP activity of pollen SPP. Silver birch (Betula pendula) and grey alder (Alnus incana) pollen were suspended in water and only the water extractable compounds, which contain the SPP, were used for oxidation experiments. The oxidized pollen particles were then dried and examined for their IN activity at cold cloud conditions using the University of Toronto Continuous Flow Diffusion Chamber (UT-CFDC). More details of the full experimental procedure are available in Gute and Abbatt (2018). In this initial study, I found the IN activity for both birch and alder pollen to significantly decrease upon OH oxidation. Additional chemical analysis points towards the molecular structure of the pollen material being altered by the OH radical. With relatively high OH concentrations used to oxidize the pollen, this study represents just the first steps in exploration of the importance of chemical processing of biological INPs. Future work will involve oxidation under more atmospherically relevant conditions, working with a wider variation of biological INPs, and studying ice nucleation under different modes than deposition freezing. The ultimate goal is to arrive at a parametrization of the chemistry that could be included in climate models that assess the role of ice nucleation in the atmosphere. 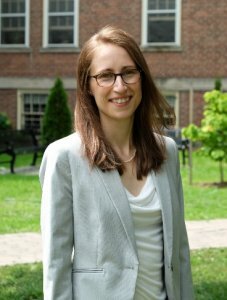 Ellen Gute holds a Diplom Meteorology Degree (equivalent to Master Degree) from the University of Mainz (Germany) and is currently conducting PhD research in the Abbatt Research Group at the University of Toronto. Boucher, O., D. Randall, Paulo Artaxo, C. Bretherton, G. Feingold, P. Forster, V-M V.-M. Kerminen, et al. 2013. “Clouds and Aerosols.” Climate Change 2013: The Physical Science Basis. Contribution of Working Group I to the Fifth Assessment Report of the Intergovernmental Panel on Climate Change, 571–657. doi:10.1017/CBO9781107415324.016. DeMott, P J, A J Prenni, X Liu, S M Kreidenweis, M D Petters, C H Twohy, M S Richardson, T Eidhammer, and D C Rogers. 2010. “Predicting Global Atmospheric Ice Nuclei Distributions and Their Impacts on Climate.” Proceedings of the National Academy of Sciences of the United States of America 107 (25): 11217–22. doi:10.1073/pnas.0910818107. Gute, Ellen, and Jonathan P D Abbatt. 2018. “Oxidative Processing Lowers the Ice Nucleation Activity of Birch and Alder Pollen.” Geophysical Research Letters 45 (3): 1647–53. doi:10.1002/2017GL076357. Hoose, C, and O Möhler. 2012. “Heterogeneous Ice Nucleation on Atmospheric Aerosols: A Review of Results from Laboratory Experiments.” Atmospheric Chemistry and Physics 12 (20): 9817–54. doi:10.5194/acp-12-9817-2012. Jaenicke, Ruprecht. 2005. “Abundance of Cellular Material and Proteins in the Atmosphere.” Science 308 (5718): 73. doi:10.1126/science.1106335. Lohmann, U. 2006. “Aerosol Effects on Clouds and Climate.” Space Science Reviews 125 (1–4). doi:10.1007/s11214-006-9051-8. Möhler, O., P. J. DeMott, G. Vali, and Z. Levin. 2007. “Microbiology and Atmospheric Processes: The Role of Biological Particles in Cloud Physics.” Biogeosciences Discussions 4 (4): 2559–91. doi:10.5194/bgd-4-2559-2007. Pruppacher, H.R., and J.D. Klett. 1997. Mircophysics of Clouds and Precipitation. 2nd ed. Dordrecht, The Netherlands: Kluwer Academic Publishers.